"I thought, 'I've set this bloody thing off and I'm going to do whatever it takes to protect the others." Guts - he did not hesitate to jump on the grenade to save his three fellow Royal Marines and said that he expected to lose a limb but hoped to keep his head and torso intact. Fortunately, the backpack that the Royal Marines carry has quite a lot of kit in it. His had a lithium battery, a medical kit and a 66mm Rocket. Thanks be to God, he got thrown up in the air and suffered only a nose bleed. 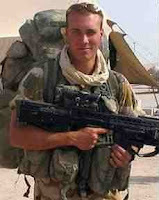 Within an hour, he was back fighting the Taliban and shot an insurgent approaching their position. L/Cpl Croucher has kept the backpack as a souvenir. Now that's something to show your grandchildren! Along with the medal of course.